Researchers at the University of Tsukuba have revealed two molecules in the brain of a sea squirt that specify the development of a hypothalamus-like region, also shedding light on how different parts of the brain form in more complex organisms. The human brain is exceedingly complex, consisting of various regions with particular functions and approximately 100 billion neurons. This complexity has presented a major challenge in understanding this organ and how it develops, particularly in view of the ethical issues associated with research on humans. In a new study reported in Genes and Development, a research team centered at University of Tsukuba has developed a novel approach for revealing how the brain forms via the creation of different types of neurons using a sea squirt, a simple organism that is a precursor to the vertebrates. Using this approach, the team identified two molecules that are vital for the development of a region of this species' brain analogous to the hypothalamus in humans, which has potential implications across the field of neuroscience. 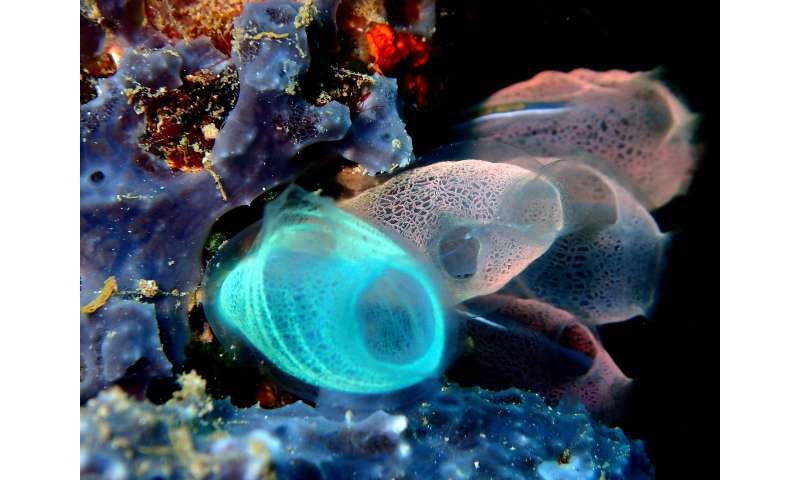 The sea squirt is a useful model for studying brain development as it presents some basic features of all vertebrates at an early evolutionary stage, while having a central nervous system containing only 177 neurons. The researchers took advantage of this simplicity by performing the sequencing of RNA for single cells across whole embryos, revealing that two molecules, Ptf1a and Meis, are vital for the emergence of dopaminergic neurons/coronet cells, a simple early form of the hypothalamus. "We were able to sequence the RNA from about 5000 cells from sea squirt embryos and identified the particular neurons that we wished to focus on by finding dopaminergic marker genes in their expression profiles," corresponding author Yasunori Sasakura says. "One gene, Ptf1a, was only expressed in dopaminergic neurons/coronet cells, but not in any other neurons, so we then analyzed it further." The team showed that blocking this gene's expression led to a failure of these specific neurons to form, while aberrantly expressing this gene throughout the nervous system converted most of the neurons into this specific type. "We then classified the cells expressing Ptf1a into different subgroups and found that those that most completely differentiated into dopaminergic neurons also expressed the gene Meis," Takeo Horie says. "Our analyses showed that these two transcription factors work in tandem to stimulate production of these neurons, which also has important implications for how the hypothalamus forms in humans." The team couldn't have made a discovery of this kind without the novel approach of single-cell RNA sequencing and manipulations such as gene knockout and overexpression. This characterization of the way in which different subpopulations of neurons are created, albeit in a simple precursor to the human hypothalamus, could help in the fight against human diseases involving dopaminergic deficiencies such as Parkinson's disease.